Canavape® Complete Cannabis Terpene CBD & CBG E-Liquid UK - Multiple Flavors are a very high end e-juice that has been expertly blended with real cannabis strain Terpenes for a delicious and effective vape liquid that is a joy to vaporize. This product comes in two different ratios for your vaping pleasure, the lowest ratio of CBD & CBG is 300/30 and the highest is 600/60 - that's 300mg CBD & 30mg CBG in the lowest and 600mg CBD & 60mg CBG in the highest ratio. This product has been made with flavors that are out of this world and if you consider yourself a cannabinoid connoisseur then you will have plenty to choose from this epic range of authentic cannabis flavored e-liquids. Canavape® Complete is a Terpene infused Cannabigerol (CBG) and Cannabidiol (CBD) E Liquid, designed for use in all electronic cigarettes so there should be no need to upgrade the kit you already have to use these products. Cannabigerol (CBG) is a non-psychoactive cannabinoid found during the early stages of the hemp growing cycle and can be extracted from budding plants roughly three quarters of the way through their flowering stage. This makes CBG one of the most valuable and potentially beneficial cannabinoids that has been found. Alongside CBG they have also introduced CBDv which is present whilst extracting CBG so a nice mix of cannabinoids for you to ingest via a vaporizer. Vaping with Canavape is a real pleasurable activity - not only will you ingest high quality CBD, you will also have the best flavored e-liquids with real cannabis Terpenes making you a very popular person, after all what can beat blowing clouds of authentic Pineapple Express while you go about your day. If required, Nicotine can be added, but we recommend you steer clear of nicotine and just vape the awesome e-juices as Canavape intended. The reception of these products in our shop in Cornwall and on the website has been very good and Canavape have quite a following especially if you are looking for the higher end CBD vape products strength wise. The 600/60 ratio e-juice really is a one of the best around, both for flavor and product consistency. If unsure which strength to go for the Canavape complete product range then we would recommend starting on the lowest strength and see how you go. Cannabinoids are most effective when used alongside each other. This creates what is known as the ‘entourage effect’. At Canavape they proud to be the first in the UK to include pure CBG in their products. Cannabis terpenes are secreted from the same glands that produce cannabinoids like THC, CBG & CBD. They are responsible for the aroma or scent of the plant. Over 100 different terpenes have been identified with each strain having its own unique terpene profile. Distinctive flavors like berry, citrus, mint and pine are commonly detected. The most interesting characteristic of Terpenes is their ability to interact synergistic ally with other compounds, like CBD and CBG. This wholesome synergy, commonly known as the entourage effect, offers a unique and therapeutic experience. Available in a choice of two strengths and many expertly crafted terpene profiles. All flavors are made with real cannabis derived Terpenes from specific strains. Shake well before use. Flavors include Super Lemon Haze (Super Sour Haze), OG Kush (OG Jane), Mango Kush (KoKo Kush), Jack Herer, Girl Scout Cookies, Granddaddy Purple, Candy Jack, Green Crack, Blue Dream, Skywalker OG, Sour Diesel, Cheese, Pineapple express. Super Sour Haze - Terpene Analysis Profile & Flavor Notes This Super Sour Haze CBD e-liquid gives sweet & sour notes with a hint of citrus goodness on the exhale, this is a pleasurable vape liquid and you will find it hard to put the sour haze down. Super Sour Haze UK is one of the best and most sought after cannabis strains going - try this authentic Eliquid variety here. Sour Diesel Terpene Analysis Profile & Flavor Notes: Vaping with Sour Diesel is a real pleasure thanks to its earthy pungent notes and diesel tang. if you are fan of any of the diesel strains then this will quickly become your all day vape liquid. Another insta classic weed e-liquid that is sure to hit the spot of even the most ardent vapers. Koko Kush or Mango Kush Analysis Profile & Flavor Notes: Mango Kush or Koko Kush, as it also known, is a true taste sensation giving you a full on tropical vibe thanks to its unique Terpene profile. The flavors on exhale will be sweet tropical notes with a hint of fresh mango. Everyone likes mango, and we are sure you will love this tropical fruit reminiscent CBD & CBG e-liquid. Candy Jack is a mostly sativa strain that provides a swift boost to your mood alongside a sweet, citrus aroma. The fragrant smell is inherited from its Skunk #1 parent, while creative and focused effects stem from the Jack Herer side of the family. You can expect a flowery undertone to this CBD e-liquid. OG Jane Doe is perfectly named because this strain is a bit of a mystery girl, though her genetics most likely include some OG. This strain is well-balanced with effects that provide euphoria and relief without sleepiness. This Jane is anything but plain, with a crisp lemon aroma Flavor overload - you have been warned. White Widow is among the most famous Cannabis strains worldwide is White Widow, a balanced hybrid first bred in the Netherlands by Green House Seeds. A cross between a Brazilian sativa land-race and a resin-heavy South Indian indica, White Widow has blessed every Dutch coffee shop menu since its birth in the 1990s. Its buds are white with crystal resin, warning you of the potent effects to come. This is what the White Widow e-liquid by Canavape is based on and this is their newest flavour for 2018 - vape in style - vape the best ganja e-liquids around. All the above are real cannabis derived Terpene profiles from the specific strains mentioned. Please be aware that the Cannabis Terpenes carry a genuine scent and are extremely realistic when vaped within our products. A true alternative to your every day CBD E Liquid! But be careful as the old bill won’t know or understand they are THC free and totally legal. 30ml Glass Bottle with applicator. KoKo Kush has a Very good flavour, Quintessential customer service was very good as usual.Good packaging and quick delivery. 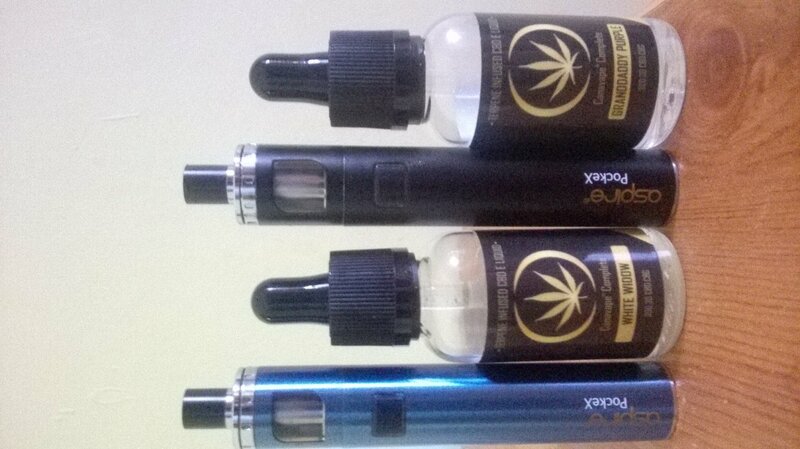 Canavape is by far the No1 when it comes to terpene e-liquid,ive tried numerous other brands which tasted of absolutely nothing I wasted over £100 trying various other brands,I was a bit hesitant spending more money but I was proved wrong with canavape,my first purchase was Sour Diesel the taste is fabulous,and the cbd was working fine,my second purchase was G.D.P. again the taste was excellent,I even mixed a little of both liquids and to my amazement it was such a smooth and taste fantastic smoke I now call it Purple Diesel overall great value for money as its a 30ml bottle with other brands its only 20ml bottles.Dont waste your money buying from anyone else buy canavape plus when you buy from quintessential you get free p&p with purchase's over £10 so your saving £5 already,I will be buying again from quintessential as there service is 100% I receive my orders within 48hrs from them. Very good flavours, will purchase again.customer service from Quintessential very good. Thank you.